A mosaic creation, whether it is a table top, a back splash or a decorative element in your tile flooring, is a work of art. You should always protect your mosaic creations from paint splatters and other substances that might damage the tile. But if you do happen to get paint on your mosaic tile, it can be removed. 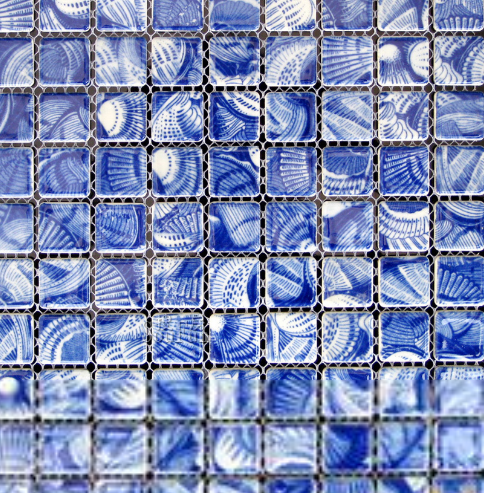 Clean up paint from mosaics in the same way that you remove paint from other ceramic tiles. With a few simple tricks, you can have your mosaic looking brand new again in no time. Firstly, mix a paint-removal solution or other powerful cleaning agent with water according to manufacturer's directions. Stir to combine the cleaning solution and water thoroughly. Secondly, apply the cleaning solution to the paint in a thick layer. Let the solution sit on the surface for 30 minutes. Follow supplier or manufacturer's directions for exact times. Thirdly, scrape paste and the old paint from the mosaic pattern with a paint scraper. Use a plastic scraper to avoid scratching the tile. Fourthly, remove any remaining paint residue with a scrub sponge. Dampen the sponge and scrub in a circular motion to remove all of the paint. Fifthly, rinse the mosaic with warm water to remove any residue. Let the tiles dry. Sixthly, combine powdered oxygen bleach with warm water according to the mixing instructions on the package. Pour the solution onto the tiles to clean any stains from the grout. Let the solution sit for 30 minutes. Scrub the grout with a scrub brush. Rinse with clean water.